What impressed us after week six of 2018 fball season? Top-ranked Derby continued to roll with a 63-0 victory against rival Hutchinson. It marked the sixth straight win for the Panthers over the Salthawks. All nine touchdowns came on the ground. By the 11:01 mark of the second quarter, Tre Washington had five touchdowns. Then, Hunter Igo tallied a pair of scores. Hutchinson nearly scored late in the contest on a long punt return from Tayezhan Crough, but Derby tackled him and recovered a fumble. Washington has 16 rushing scores. Dodge City trailed Hays High, 20-0, at halftime and 33-14 at the start of the fourth quarter in a Western Athletic Conference road game in the Indians’ Homecoming at Lewis Field Stadium. DC scored 20 unanswered points, including the eventual game-winning touchdown on an 85-yard hook and ladder from John Johnson to Jaiel Johnson. Aaron Hamilton picked off three passes as Junction City defeated Manhattan, 9-7, and won the Silver Trophy in one of the state’s top rivalry games. Hamilton had two of his three interceptions in the red zone. In a high-profile Sunflower League matchup, Shawnee Mission East had a big 35-28 road win against Olathe North, ranked in the top-5 in Class 6A. SME, under first-year coach Justin Hoover, had a fourth-and-goal stop at the 1-yard line. The Lancers followed with a 99-yard drive to go up by seven late in the fourth quarter and held on for a road win. Blue Valley Southwest had a 53-yard field goal by Dominik Stadlman against Blue Valley North. BVN defeated BVSW, 48-6. The Mustangs have won three straight after an 0-3 start. Congrats to first year HC Aaron Hafner on his first win at Olathe Northwest last night, 29-21. 49 carries for 432 yards as a team. Andrew Dumas had 17 carries for 186 yards. 3 Total TDs Cole Manning had 19-133. 1 TD. Maize allowed its first touchdown of the season in a 42-7 road victory against winless Salina South. Quarterback Caleb Grill passed for five touchdowns. The Eagles have allowed just nine points this fall. Bishop Carroll again won the Holy War versus rival Kapaun with a 28-14 victory. Carroll’s quarterback injury problems continued and had to use fourth-string quarterback Drake Unrein at a key point in the game. Clay Cundiff hauled in a five-yard touchdown pass with just under two minutes left. Carroll has beaten Kapaun every year since 1999. Mill Valley earned a 35-13 against Pittsburg in a non-conference game. The contest against showed the strength of the Eastern Kansas League as MV entered 2-3 and Pittsburg was undefeated and ranked in the top-5 in 4A. Wichita Heights had a significant challenge from Wichita South and needed overtime for a 32-25 victory. The Falcons standout quarterback K’Vonte Baker was hurt early, but Heights held on and avoided the upset. Heights trailed 25-10 at one point before 22 straight points. Basehor-Linwood led 28-7 and beat previously undefeated De Soto, 35-27. Bishop Miege defeated Blue Valley, 29-15, on the road in the Eastern Kansas League and received a big game from Jaylen Scruggs with two interceptions and a touchdown. The Stags picked off six passes. Miege also held BV for four downs on the 1-yard line. Undefeated Paola picked up a big Frontier League victory against K.C. Piper, 41-12, with 21 carries for 198 yards from Connor Hasz. Paola has four shutouts. Smoky Valley stayed undefeated with a 30-22 home win versus Chapman in a battle undefeated, power-run heavy squads. Tim Lambert scored two touchdowns, and Lane Schrag threw a TD pass and had a 67-yard run. SV has quality wins versus Hesston and Chapman in two of the last three weeks. Marysville quarterback Brandon Schroedl finished 10 of 11 passing for 227 yards and five scores, all in the first half. The Bulldogs won 61-20 at Royal Valley. Andale had a fifth straight shutout and put up 50-plus points for the fourth consecutive game with a 55-0 win against Wichita Collegiate. The Indians have been statistically the state’s most dominant team with a 308-14 differential and continue to lead a stacked 3A full of dominant teams. Hesston continues to regain health of key players and delivered its second straight win with a 54-30 road victory against Rock Creek. Parker Roth had 18 carries for 307 yards and five TDs. The Swathers (4-2) have wins against Halstead and Rock Creek in districts with a key road game versus Chapman this Friday. In a rare Thursday night game due to the weather, Hoisington beat Minneapolis, 41-6. The Cardinals defeated the Lions for the first time since 2004. Wyatt Pedigo had 227 yards with two scores. Xavier Robinson had his first 100-yard rushing game and delivered a pair of touchdowns. Conway Springs rolled over struggling Whitewater-Remington, 68-20, including 61 points in the first half. Collin Koester had five touchdowns on runs of 13, 48, 50, 37 and had a 65-yard kick return TD. District 5 features two surprising teams with Douglass and Fredonia both at 5-1. Douglass was 3-7 last year, and Fredonia was 3-6. Douglass defeated Cherryvale, 44-8, with a 99-yard touchdown pass. Fredonia held off Belle Plaine, 28-23. Halstead beat Clay Center, 50-22, as Scott Grider rushed for 284 yards and five TDs. Cimarron moved to 5-1 and gave Lakin its first loss in a key district and Hi-Plains League game. Cimarron scored a fourth quarter touchdown and won 18-14. Senior Anthony Erives had his second straight big game with 15 carries for 130 yards and a TD, as Lakin limited standout sophomore Tate Seabolt to just 35 yards. Hillsboro moved to 5-1 and had a big play with a long interception return for a score from 6-foot-2, 260-pound Wes Shaw as the go-ahead score in an 18-14 win against Marion. The Trojans had captured just one victory last year. Inman’s Matt Ramey recorded five carries for 199 rushing yards and two scores. The Teutons, enjoying a nice season, had 21 carries for 412 yards. Inman defeated Sublette, 56-6, and moved to 4-2 after a 0-9 record last fall. Pleasanton moved to 6-0 and held on to beat Uniontown, 26-20, to capture the Three Rivers League title. The Blu-Jays are a win away from their fourth straight season of wins improvement and get a huge matchup at Colgan this week. Jackson Heights beat Troy, 8-7, in a high-profile District 3 contest. JH wanted to improve its strength of schedule this year and did so with a solid last month. The Cobras have asserted themselves as a top-five 1A team a 3-1 last four weeks. Jackson Heights has allowed just 41 points this season and 4-0 on the road. They won 14-0 at Maur Hill, lost 20-18 to Olpe, won at Valley Heights, 22-14, and at Troy, 8-7. Central Burden’s Clayton Cook had 10 carries for 188 yards and three touchdowns as the Raiders earned a key win against Udall. Central Burden beat Oswego, 78-30. Oswego entered the game with just one loss. C-B moved to 4-2 with three straight victories. In District, South Central moved to 5-1 and established control of the district with a 36-14 win against Caldwell. Chayde Snyder passed for three scores and 192 yards and rushed for 82. The game was tied at 14 at halftime. SC is the only undefeated team in district play at 3-0 and has permitted just 70 points this year. St. Francis improved to 6-0 with a quality 44-6 road win against Leoti-Wichita County in a high-profile District 8 contest. The Indians are in complete control of the district and reaffirmed its top-five status in the classification. Also in District 2, Medicine Lodge bounced back from a high-profile loss to South Central with a key win against Udall, 58-14. Last week, Udall had pulled an upset versus Argonia-Attica. Quarterback Garrett Burden completed 22 of 28 passes for 377 yards with six touchdowns. Dakota Bayliff recorded eight catches for 249 yards and four scores, along with a fumble recovery for a touchdown. Spearville earned a critical district win, 16-14, against Ness City. Kolby Stein had 38 carries for 209 yards. He completed one pass for 17 yards, along with eight tackles and a fumble recovery. The Lancers moved to 5-1 headed into its big rivalry road game versus Hodgeman County. Spearville and Hodgeman County are 3-0 and this week should be for the district title. Bennington’s Javon Allen finished with six total scores. The Bulldogs beat Peabody-Burns, 76-42. Chase County had a big game from sophomore tailback Trint Rogers. With a significant number of carries on the trap, he had 19 carries for 295 yards. Lebo beat CC, 46-30. Solomon’s Logan Krause had seven carries for 128 yards and four scores with 3.5 sacks. The Gorillas rolled over Herington, 60-0. 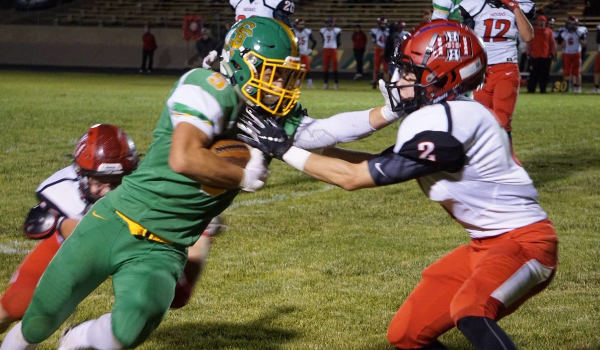 Hanover survived a big test from undefeated Axtell in a Twin Valley League contest. The Wildcats held on to win, 50-42, after they trailed in the third quarter. Axtell led Hanover, 34-28, in third quarter. Hanover has won 31 straight games. In one of the most unique finishes in recent Kansas history, Otis-Bison and Kiowa-South Barber tied at 36 in a game that was called at halftime due to severe weather. The top-five teams went back-and-forth in just the state’s third tie since 2006. The game featured 680 total yards and five turnovers. O-B quarterback Anton Foust returned a kickoff for a score, had 92 kickoff yards, 74 passing yards and 236 rushing yards. He passed for a TD, and rushed for three long TDs. SB quarterback Trevor Rooks enjoyed a big game with 174 passing yards, 89 rushing yards, two passing scores and three rushing TDs. O-B has lost just one game, with South Barber remains without a loss. Quinter snapped a 33-game losing streak with a 54-20 Homecoming victory against rival Wheatland-Grinnell. The Bulldogs last played their in-county foe in 2011 and moved to 5-0 against the Thunderhawks since ’04. Quinter had been close to winning earlier this year with a pair of one-score losses. It marked the Bulldogs’ first win since October 10, 2014 win a 54-34 home win against Logan-Palco. Frankfort improved to 6-0 behind Garret Dalinghaus. He rushed for 216 yards and six touchdowns. Frankfort beat a solid Beloit/St. John’s-Tipton squad, 60-14, and bumped to 6-0. Mankato-Rock Hills’ Zane Colson, a four-year starter, had 21 carries for 339 yards against South Cloud. RH defeated Southern Cloud, 48-0. Clifton-Clyde defeated Stockton, 54-0, behind 33 carries for 342 yards and five scores. Ashland, in its first year of six-man football, is the only undefeated six-man team at 5-0 with a 48-6 home win against Fowler. Weskan moved to 3-2 and defeated previously unbeaten Golden Plains, 52-46, in a home matchup. The Coyotes had split games versus GP last fall, though lost the regular season matchup.